The pom.xml file must be available through one of the following protocols: http, https, or ftp. Note: The file protocol is also supported but is disabled by default for security and must be enabled manually. The pom.xml can also be uploaded from a local file. Note: This doesn't support multi module projects. You can supply a username and password if the POM URL requires authentication. This information will be stored in the database in plain text and reused later for SCM checkouts and updates. If your SCM stores credentials like CVS or SVN and you want to use the SCM Credentials cache, check the Use SCM Credentials Cache field. You can define the group you want to use or Defined by POM in this case project.name will be used as Project Group. You cannot add a duplicate project (duplicates would mean another instance of a project with the same groupId, artifactId, and version) in the same Project Group. This project tree means that there will be three Continuum Projects added in Continuum. Let's say, the top level project was assigned a project id of '1' when it was added in Continuum and module-a got a project id of '2' and module-b got a project id of '3'. Now in Continuum's working directory, you will see these projects checked out as below. Note that their project ids correspond to their own working directories. You can force Continuum to check out the entire project into a single directory by selecting the Checkout multi-module project in single directory radio box. Note: If your project has a flat structure similar to the one below, you might want to check out your project into a single directory to be able to release it in Continuum. If you want to add the multi-module project as a single Continuum project, select the load only root as recursive build radio box. For a project or POM that was added as a single Continuum project and as it's own project group, the --non-recursive flag in the default project group build definition will be removed. But if the project or POM was added as a single Continuum project to an already existing project group, a project level build definition with the --non-recursive flag stripped from the arguments field will be created for the project and will be set as the project's default build definition. See CONTINUUM-2563 for the related issue. You can choose a Build Definition Template which will be applied to your project. If you choose a Build Definition Template, the build definitions from the template will be added in addition to any build definitions that are defined at the project group level. When adding projects whose parent project is building on another server, make sure that the settings.xml with the necessary repositories exists in [USER_HOME]/.m2/ directory. Continuum uses [USER_HOME]/.m2/settings.xml and not the one found in [M2_HOME]/conf/. 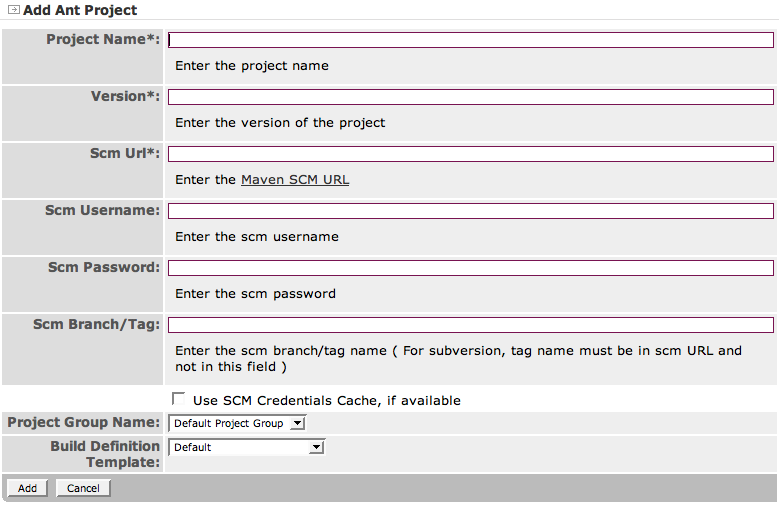 The scm connection url must be present in the POM and must match the actual location of the pom in the scm repository. The project.xml file must be available through one of the following format : http, https and ftp. Note: The file protocol is off by default for security and must enabled manually. The project.xml can also be uploaded from a local file. Note: This doesn't support multi modules project. The project you're adding can't use a parent. You can define username/password if the POM URL require an authentication. 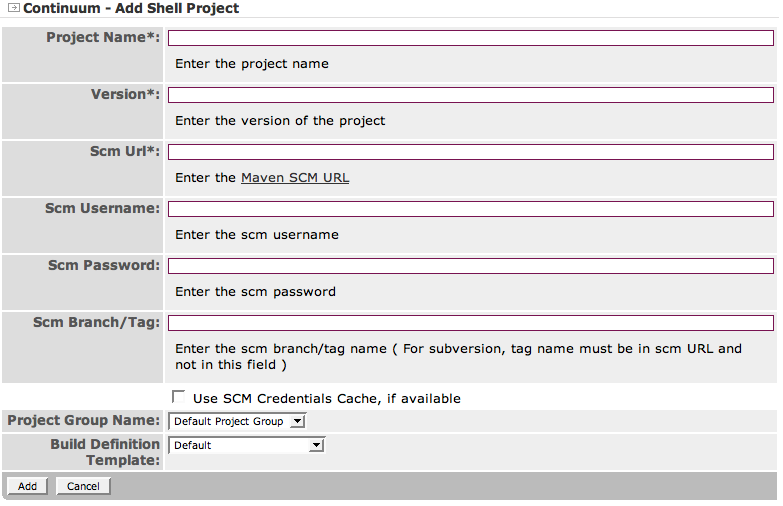 If your SCM store credentials like CVS or SVN and you want to use the SCM Credentials cache, check the Use SCM Credentials Cache field. You can define the group you want to use or Defined by POM. In this case project.name will be used as the Project Group. You can choose a Build Definition Template which will be applied to your project. From the Project Group, you can add a project without using the menu. With this operation, the Project Group will be set to the current group. This configuration won't work with each ClearCase installation because each ClearCase configuration is different, so we recommend reading the ClearCase page on the Maven SCM site.